I'm not sure, at this moment, this band could have a better and more appropriate name - the Civil Wars. With only one full-length album (and one Ep), their eponymous new release is most likely their last. While there are only two members of the group (Joy Williams and John Paul White), on the eve of a tour last year, they abruptly cancelled it and went on hiatus. Just as surprisingly, they were back in the studio, but if rumours are true, rarely at the same time and to hear them talk - currently they don't, at least to each other. Yet they've made a beautiful album. Possibly the album of the year. Maybe it is just me, but between the beautifully executed harmonies, strong melodies, pristine arrangements and crisp production, the lyrical animosity is thicker than thick. It could be coincidence, but I would guess with their recent history, that animosity has to come into play. They make it work for them. As Williams said - it's not what you do to avoid the tension, it's what do you do with the tension. They capitalized on that tension with The Civil Wars. Most songs were written one to three years ago, which isn't a surprise since they don't seem to be communicating. When Williams sings, on the first track "The One That Got Away", "I wish you were the one....wish you were the one that got away", twisting any thoughts of what you expected the title to convey, you assume they are directed at White. Even if not, it is easy to backstory. Seemingly, there are barbs, words of sorrow and regret like that all throughout the entire disk, but since the songs are older, people might read meaning into the lyrics that don't reflect the true present. As said, the writing and arrangements are strong. I dig "the One That Got Away", but I think "Dust to Dust" and "Eavesdrop" might be the highlights of the disk. On the former, the arrangement is so sparse, yet has so much depth, it is quite amazing. If radio had any backbone, a song like "Eavesdrop" could easily be a crossover song that would do very well. It has a great melody and truly builds as it goes along - musically and vocally. I like the vocal sharing between White and Williams. I don't say this in a bad way at all, but the songs are a bit too fractured to make this a complete crossover disk in any direction. The songs are steeped in Americana /Appalachian ("From this Valley", "Devil's Backbone"), rock/blues ("I Had Me a Girl"), folk ("Dust to Dust") and country ("Tell Mama"). Both Williams and White have fine voices, but they work better together than separately, and that becomes apparent in "Sacred Heart" when it is mostly Williams singing solo. While a beautifully song done in French, it seems out of place with the rest of the disk - it is one I won't be going out of my way to play. I'm also not the biggest fan of "Oh Henry". It's not bad, but it doesn't measure up to the other songs. The biggest disappointment though is the limited use of White's vocals, and it is a Williams-heavy album. As I said, their vocals work best together - even his harmony vocals seem muted much of the time. One of the most interesting things about the disk is the final track, "D'Arline". The lead vocal was recorded on the iPhone 4S. I just find that cool. 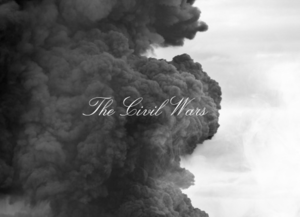 Right now, the Civil Wars is the best disk I've purchased this year. I've been streaming it for over a week and playing the hell out of it before I download. It is definitely worth a listen if not an out and out purchase. Consider the attached video for "The One That Got Away" a bonus My Music Monday Thursday. Clearly the two are in the studio together, but I'm not sure how much if for PR or video purposes and even if remotely really recording on the video, some of the melody vocals were already done before harmony were put on. Williams looks like a less dirty Johnny Depp. I am cynical enough (no, it's true!) to think that the stories of not talking, breaking up, etc are nothing more than a public relations plan to get major buzz for an album months before it was even going to be released. If it is the case, they owe their marketing firm a bonus because it has worked very very well. Ooo... I like. New music. For me.